Porini Amboseli Camp lies just outside Amboseli National Park in the Selenkay Conservancy. The Selenkay Conservation Area, covers 15,000-acre private game reserve in the northern part of Amboseli. Selenkay Conservancy is an important dispersal area and rangeland for wildlife migrating out of Amboseli. The camp provides an exclusive experience catering to a maximum of 18 guests at a time. Selenkay Conservancy is in the north of Amboseli National Park. The camp has 9 spacious guest tents, comfortably furnished and with en suite bathrooms including shower, wash basin and flush toilet. Tents have solar-powered electric lighting. 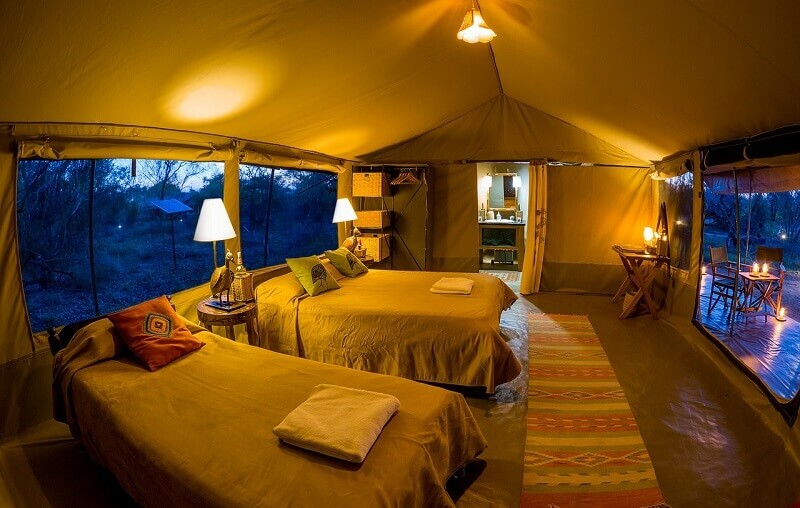 Tents are large and comfortably furnished each with a double and a single bed, solar-powered electric lights, and en suite bathroom with safari shower, washbasin and flush toilet. Meals are taken under the shade of an Acacia tree and after dinner we can sit around the campfire and listen to the sounds of the African night. The camp is staffed entirely by members of the local Masai community apart from the manager and head chef. Contact Us for a Free tour Quote on Porini Amboseli Camp Honeymoon Package! Great Discount Safari Offers.